Today a bunch of twitter friends having a little Twitter Food Party. It's fun: we agree on a dish, and then everyone makes their own version of it. Today it's PANCAKES! You can be loose with your interpretation, like savory or sweet, and also different cultures come into play. I thought about Pfannekuchen (a German pancake with fruit - sooooo good), but I settled on crepes. In this bento: crepes (filled with thinly sliced white mushrooms, provolone cheese, and roasted turkey breast), baby carrots, roasted brussel sprouts with walnuts from the Santa Rosa Original Certified Farmers Market and Point Reyes Original Blue Cheese , flower shaped watermelon radish slices from Wild Rose Ranch, 'rabbit' apples from Lambert's Apples, and some steamed edamame. I got this bento box at Borders Books this past week. I saw Sheri of Happy Little Bento post some pictures of their new bento boxes (made by Paperchase) and I just had to go out and get it. This is actually the largest of 4 boxes, each nesting inside of the next. Each one has a different little xmas image on top. So darling! And I got four bento boxes (yes, the small one is pretty small) for 10 bucks! Woot! If you are on twitter, check out #twitterfoodparty for all of the fun pancake dishes today. 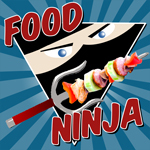 And join us next time for foodie fun! You got 'em, so cute!! 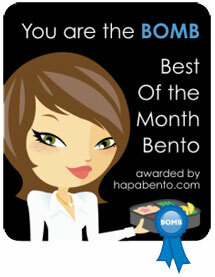 Isn't twitter great for #bentoenablers? Very nice crepes idea; I haven't tried making them but they're a nice alternate for rollups, which I like to make a lot for bento. Roasted Brussels are another yummy favorite. 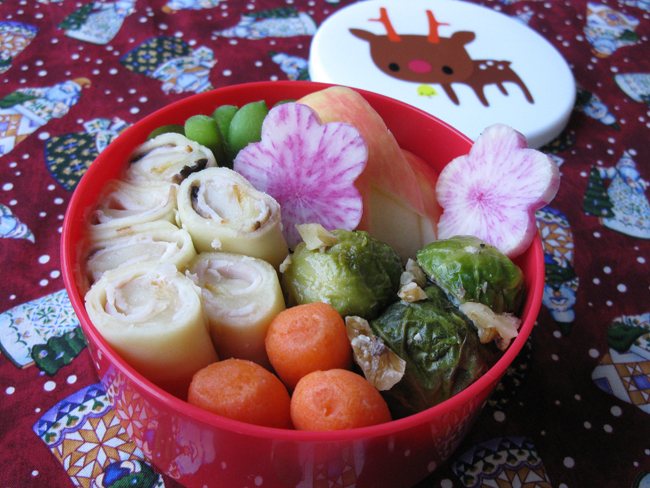 This bento would go fast around here! Thanks for playing #twitterpancakeparty! Thanks sheri! I got the fruit bento boxes too, couldn't resist. Crepes are pretty easy to make and they freeze well. Here's the recipe I used: 1/2 cup milk, 1/2 cup flour, 1 egg, 1.5 tblsp melted butter, 1/4 tsp salt, 3 tblsp water. Blend all ingredients about 4 seconds. Let batter sit for 2 hours or up to 24 hours. Cook crepes over medium heat, use more melted butter to grease the pan. I love the box and it is filled so pretty! The crepes look yummy! Actually one of my favorite ones are turkey dill crepes. Bingo! I had to search around a bit to find the bento boxes at Borders. I would call ahead to make sure that they have them. OK, now I have an excuse to go to Borders. As long as I'm there, I may as well go to Michael's Crafts, too. I'm drooling. When will dinner-time get here? Have fun dragonmamma! The bento boxes were on the right as you head into the store, near the SBC. If you have trouble finding them, ask an employee to show you the Paperchase merchandise. Pretty cool stuff! Thanks Jen! 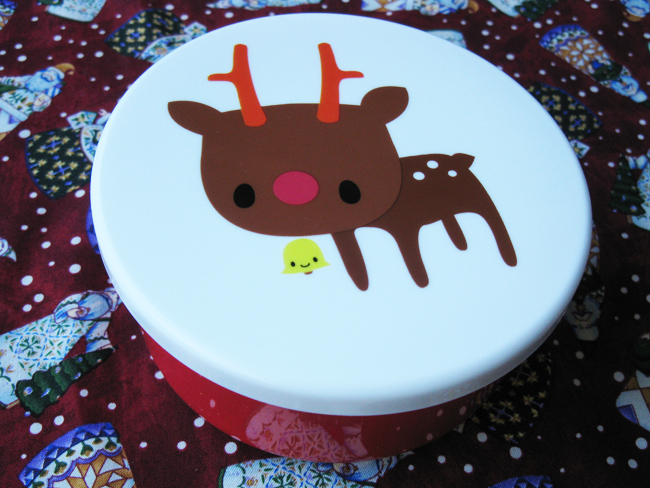 I'll showcase the other boxes later this month, they are soooo cute. Super cute! I love it (crepes are one of our FAVORITES!) and I love that box, too. Thanks Yenny! It was really delicious.